The Strutt family were also instrumental in pioneering the idea of parks and public gardens in the United Kingdom, and Jedediah’s youngest son, Joseph, donated the Arboretum to Derby, and promoted its use in the 1840s. By the early 1900s, the Strutts had sold on their business to the English Sewing Cotton Company, and Joseph’s great-nephew, George Herbert Strutt, was in a position of considerable wealth, and able, in the years to come, to act as a major benefactor to the town of Belper. One of his greatest gifts was land and boating rights along a three-mile stretch of the River Derwent, north of the mill weir to the newly formed Belper Boating Association. They built a boathouse and landing stage on an island on the east bank of the river, reached by bridges, and the Grand Opening Carnival took place on 4th July 1905 before 2,500 people. The venture was such a success that it was decided to expand the site and improve its amenities into formal gardens, similar to those at Battersea Park in London and Belle Vue in Manchester. The river was dredged, and the spoil used to create a promenade; refreshment rooms and a bandstand. 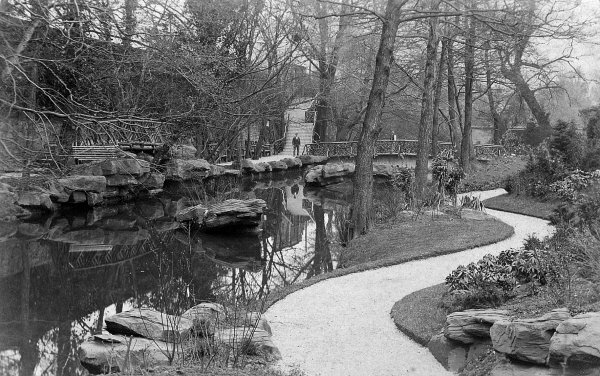 The man-made channel (or ‘lade’) that ran along the east side of the site – which had provided water to Strutts’ South Mill since 1776 – was transformed into a water garden, and the site was re-named the Belper River Gardens, and officially opened on Easter Monday, 16th April 1906. George Herbert Strutt financed all of this redevelopment himself, and, once again, the venture was so successful that further landscaping continued throughout 1906 and early 1907. A new walk, named Lion Walk, was created along the base of the exterior eastern wall, with rustic fencing placed along the river edge. During the First World War, the gardens were adapted for other uses, and the Belper Boating Association was forced to dissolve. George Herbert Strutt decided to give the River Gardens to the English Sewing Cotton Company, who eventually offered them to Belper Urban District Council in 1955. Certain changes were required before the Council finally agreed in 1966, and ownership was again transferred on the formation of the Amber Valley District Council in 1974. ‘To increase the range of features within the gardens, it was decided to have a fountain set in a rockwork pool in the newly created area of land between the first riverside path and the new promenade, which had so recently been black mud and reeds. 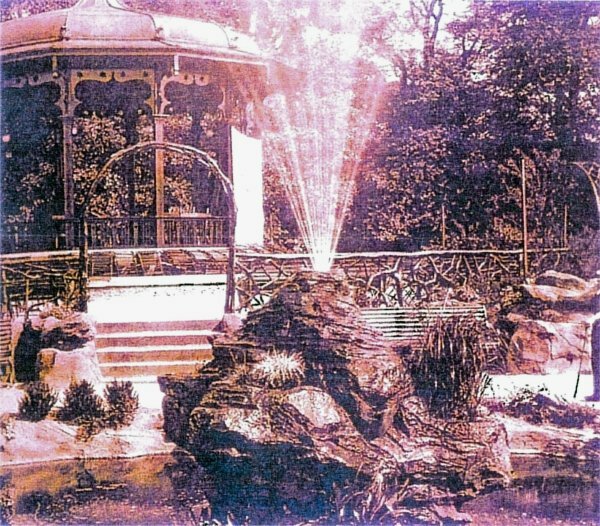 The fountain chosen may have been selected in emulation of a similar fountain at Matlock Bath, and in September 1906 the firm of Pulham and Sons of Broxbourne were called in to install the River Gardens fountain. ‘The arrival of Pulhams on the scene was to have a significant effect on the landscaping of the River Garden, and they carried out extensive further work from September until April 1907. This also included alterations to the lines of the newly laid out paths and additional planting, but, above all, the installation of considerable amounts of the firm’s speciality, of artificial rockwork. In an area such as Belper, replete with readily available natural stone, which had been used in the 1905-06 landscape, this might seem a strange decision, although there were no recorded comments to this effect. To preparing for, constructing rocks in banks between Bandstand and Margins of water, diverting path and reforming island, with deep foundations and cropping out rocks, forming and shaping ground and turfing: £ 80 – 10 – 0d. ‘The island referred to was that in the fountain pond which also had a surround of rocks with planting pockets, and rockwork was used in the re-made islands in the water garden. ‘From January 1907 the work was mainly concerned with the installation of the firm’s rockwork and associated landscaping of the water garden, the realignment of paths, together with work to the boating ground entrance and the new entrance, also from the Matlock road. . . . 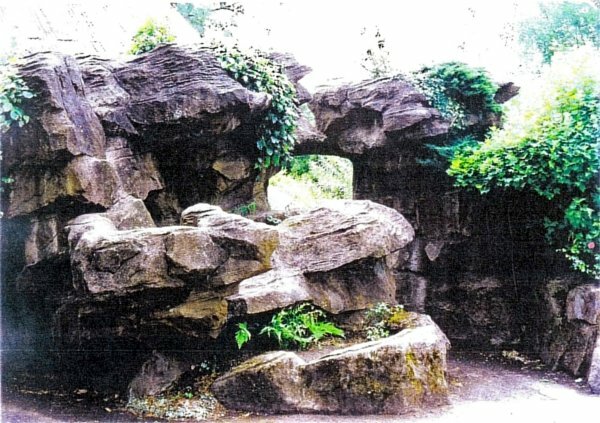 Fig 1 is an old photo of some of the rockwork in the gardens. Fig 2 shows the rockwork fountain near the bandstand, and Fig 3 the rockwork screen constructed to shield the view of the entrance to the boathouse. Finally, Fig 4 is a more up-to-date view of the Serpentine Walk near the entrance bridge. Figs 1 to 3 are all reproduced by permission of Parklands Consortium Ltd.
Posted on April 1, 2013 June 4, 2016 by Claude HitchingPosted in Sites Month 2Tagged . . James Pulham and Son, Belper River Gardens, fountain, George Herbert Strutt, Hardy Plant Nursery Elsenham, rockwork.